Bridging Chinese Medicine and Western science is tricky. We cannot always find an exact meeting place, but since all medical practitioners are trying to understand the same thing (the human body in health and disease), all is not lost in translation. The Autonomic Nervous System (ANS) provides a great starting point for the western mind to understand the Chinese principle of Yin and Yang. 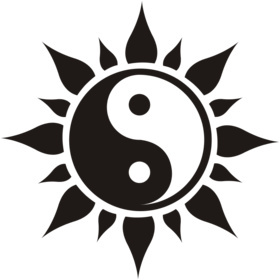 Yin and Yang are energies that give rise to physical manifestation. Western science is masterful at examining, classifying, and tracking physical manifestation. Chinese Medicine is equally adept in the realm of Yin and Yang. I relate the Sympathetic Division to one’s manifestation of Yang energy, and the Parasympathetic to one’s manifestation of Yin. Western medicine tends to dissect and treat the parts of the body. Chinese Medicine tends to observe systems and treat patterns of disharmony. Western medicine would attempt to treat the hypothalamus directly to resolve certain ailments while Chinese Medicine would attempt to balance Yin and Yang to achieve the same results. –Excerpt from the IJHPA Volume 1 Issue 1 Summer 2012 Yin, Yang and the Autonomic Nervous System by Cindy Black, L.Ac. 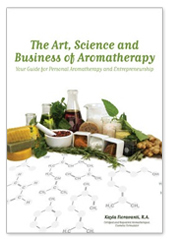 The Art, Science and Business of Aromatherapy-A must have! Anyone who knows me knows that I “collect” a lot of books and use them for reference, but rarely have the time to read them cover to cover. That changed when I received a copy of Kayla’s new book (her second) and started reading it from cover to cover. From the very beginning of the book, I believed this book was written for me. Kayla tells her story, which could have easily been my story or yours. When launching a new business we all have a starting place and have had setbacks. We also learn a lot as we go. Thankfully Kayla has written this book which encapsulates her experiences; the good, the bad, and the lessons learned and shares them very candidly. I was very inspired, which may sound odd for a person who has been in this industry for a while. In reading through the early part of her book, I find that Kayla and I had many things in common, but one in particular—The difficulty of letting go! It’s hard to change a business model after you’ve invested so much time, energy, and money into something. Having the leap of faith to end one thing and start another is scary. This lesson is a timeless one and can be employed at any stage of your business or career. In addition to the inspiration I received from this book, I found it to be extremely practical and provided lots of information beyond the general basics of aromatherapy. Kayla provides in-depth instruction and information for making and labeling products. She includes sound advice on building your brand, working smart, good manufacturing practices, and how to navigate industry regulations. This book is a “must have” for anyone interested in the business of aromatherapy products, as much attention is given to the lesser discussed aspects of ingredients, safety issues, fragrance, preservatives and FDA definitions. Herbal medicine has been practiced all over the world for as long as we have records of human activity. Not surprisingly, there are some beliefs and “old wives’ tales” that we find in nearly every culture, and one of these is that nature will provide what you need, when and where you need it. At the beginning of summer, as we enter the season of allergies, what plant medicine does Mother Nature provide from Canadian soil? To find out sunscribe today to the IJPHA. Visit us online at www.enhancedgifts.com to view our IJPHA page. The subscription button is at bottom of the page. Palmarosa (Cymbopogon martinii) is another example of a versatile essential oil that seems somewhat undervalued in aromatherapy, perhaps due to poor coverage in books. It is not widely reported that this oil is a powerful antimicrobial that can also out-perform tea tree as an antifungal, making it perfect to treat athlete’s foot and other stubborn fungal infections. The powerful anti-viral properties of palmarosa could mean it is your best line of natural defence against Swine Flu, especially when blended with other antiviral oils such as Anise star (Illicium verum) and Ravensara (Ravensara aromatica). Welcome to The International Journal of Professional Holistic Aromatherapy. The IJPHA aims to provide education, information, and resources for the professional holistic aromatherapist. Each peer-reviewed issue is available in print and is published quarterly. The IJPHA provides an opportunity for you to share your expertise! We are happy to accept your articles and case studies for inclusion in the journal. Contact the editor for more information on topics and writing guidelines at enhancements@ameritech.net.